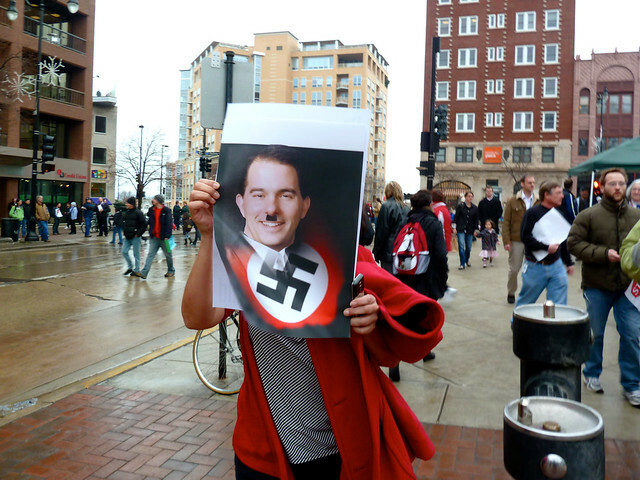 Remember when Scott Walker was Hitler? A new study finds that on average, households need to shell out an additional $1,398 per year in taxes for 30 years just to cover state employee benefits. American taxpayers would have to pay anywhere from $329 to $2,475 annually per household for 30 years, depending on what state they live in, to remedy the crises in their public employee pensions, a new study said Wednesday. Taxpayers in New Jersey, New York, Oregon, Wyoming, Ohio and California would face the highest tax increases to fully fund their state's pension obligations, assuming no policy changes, the researchers said. For example, New Jersey households would have to pay $2,475 annually for 30 years, the highest. The lowest increase would be for Indiana households, which would have to pay $329 annually for 30 years to fully fund their public employee pensions, the researchers said. Nationally, the average increase for households would be $1,398 annually for 30 years, said Rauh, an associate professor of finance. Notice blue states top the list of most owed and red states top the list for least owed. "Notice blue states top the list of most owed and red states top the list for least owed."